A totally unique — and totally fun! — tree-based adventure park, proudly located at Ijams Nature Center. A tree-based adventure park? What’s that? New to the United States, aerial adventure parks have been popular in Europe for a number of years. Adventure parks typically consist of a series of pole-based structures connected by different “challenge elements” and, sometimes, ziplines. At Navitat, we’ve taken the very best components of the self-guided aerial adventure park model and built it in and among the trees! When you visit Navitat Knoxville, you’ll find something truly spectacular and unique — an adventure you’ll want to experience over and over again, and one you’ll rave about for years to come! Begin your adventure at the Navitat welcome desk inside the Ijams Visitor Center. After check-in, you’ll walk a short distance to Navitat’s Adventure Outpost. 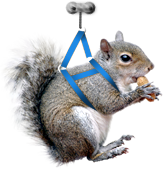 Here, our highly trained and friendly staff will outfit you with all the necessary equipment for your time in the trees. During your Safety Briefing, you’ll learn how to use your equipment and about the adventure park elements. Next, you’ll take a short walk in the woods to the Treehouse, our central platform from which all six adventure trails begin. Our Adventure Crew members will help you select a beginner or moderate trail to start with, and then you’re off – zipping, climbing, and conquering elements as you go! Each adventure trail consists of 10 to 12 challenge elements connecting you from tree to tree to tree… you’ll exit the course by zipline, a downward climb on a net, or an easy, controlled descent using equipment that lowers you to the ground. Once you finish an adventure trail, it’s back to the Treehouse to choose your next adventure or try the same trail again to become a real master – your choice! Ready to adventure? Check out our Rates & Hours as well as our Requirements & Policies, then come see us! Admission includes a safety briefing and orientation followed by two hours of adventure time on the course! The course is made up of six different “adventure trails” originating from our uniquely constructed treehouse! Each trail consists of 10 to 12 challenge elements. Challenge elements include ziplines, bridges, elevated tunnels, balancing challenges, rolling barrels, climbing nets, and more! Adventure trails are rated for difficulty, ranging from easy to accomplish to more difficult. Complete as many adventure trails as you like – or repeat some, if you wish! – during your two-hour adventure window. Our SmartSnap safety equipment allows you to navigate through the trees independently while our trained Adventure Crew monitors your progress and assists as needed!